Microsoft requires an account to download any things from Windows 10 store, for which you usually create an account and log in. If once you have done it then you always have to face new problem that is at every booting time you have to log in in Microsoft Account. It will annoy you much but you can overcome to this problem by using below given process. -> First of all, click on Start button and then click on PC Setting. You can also use short key Windows + 1. 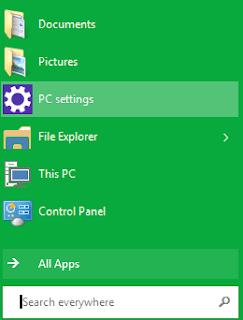 -> After that a PC Setting window will appear in which select Users and Accounts option. After that you will get three option. Choose first option Your Profile. -> Now Profile window will appear, in which you to click on Disconnect option. After clicking on Disconnect you will be asked your password to deactivate your account. -> After providing password, a new window will appear for setting up new password by which your computer will start. Give New password. -> Now, You are out of problem, Start your computer using new password. You can also disable new password.